Distinctive capabilities can be of many kinds: patents, exclusive licenses, strong brands, → effective leadership, → teamwork, or tacit knowledge. Reproducible capabilities are those that can be bought or created by your competitors and thus by themselves cannot be a source of competitive advantage. Many technical, financial and marketing capabilities are of this kind. 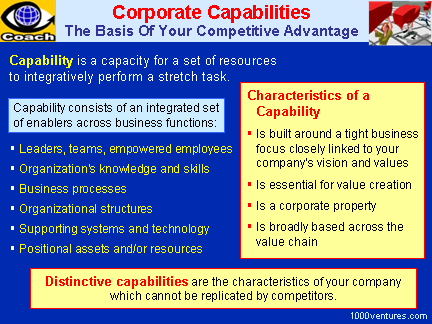 Your distinctive capabilities need to be supported by an appropriate set of complementary reproducible capabilities to enable your company to sell its distinctive capabilities in the market it operates. Long-term corporate success is linked to the ability to innovate. Although corporate investment in → improvements to existing products and processes does bring → growth, it is new game changing breakthroughs that will launch company into new markets, enable rapid growth, and create → high return on investment. Companies that are not bound by prevalent fallacies and rules of conventional wisdom have been able to break out of the pack, create a new highly profitable market niche, and win customers.